Aqua Clear is a colourless coating, which is quick drying. It penetrates into the pores of the material under treatment to bind the particles together in tough resilient, abrasive-resistant enamel.It provides a protective barrier on porous surfaces, which resists chemical attack and eliminates dusting. Aqua Clear is a one-pack, colourless coating which provides integral protection for building materials. Aqua Clear is based on styrene acrylic copolymer resin and is especially suitable as a base for protective enamel and waterproofing masonary compound. ADVANTAGES:INTEGRAL PROTECTION: Unlike most surface treatments such as many polyurethane based products, Aqua Clear penetrates the capillary structure and provides a tough. Clear protection which becomes a composite part of the structure. This penetration means that with Aqua Clear, failure will not occur through peeling of the surface coating. VAPOUR PERMEABLE: Aqua Clear allows materials to breath. Although forming an enamel coating impervious to water. Aqua Clear allows the escape of moisture vapour which could otherwise cause blistering. NO WATER: Aqua Clear is water free. This means that application can take place down to O° C provided surface is frost/ice free. 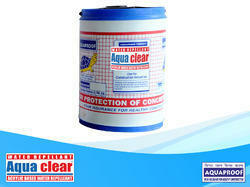 Aqua Clear can be applied to slightly dump porous surface. ECONOMICAL: Aqua Clear is inexpensive. It gives long life protection at 1% of the cost of an epoxy finish. Looking for Water Repellant ?